If you’re crazy about Lisa Kudrow, today is your lucky day: We ranked her at #1 on this list of history’s most influential female scientists. Rachel Carson was a pioneering marine biologist whose famous book Silent Spring made her the mother of the modern conservationist movement. Rachel Carson’s dedication to preserving the natural world has inspired generations of environmentalists after her. But we said we’d throw Kudrow fans a bone, and here it is: Rachel Carson was neither as skilled nor as influential a scientist as Friends star Lisa Kudrow. You’re welcome, Kudrow-heads! 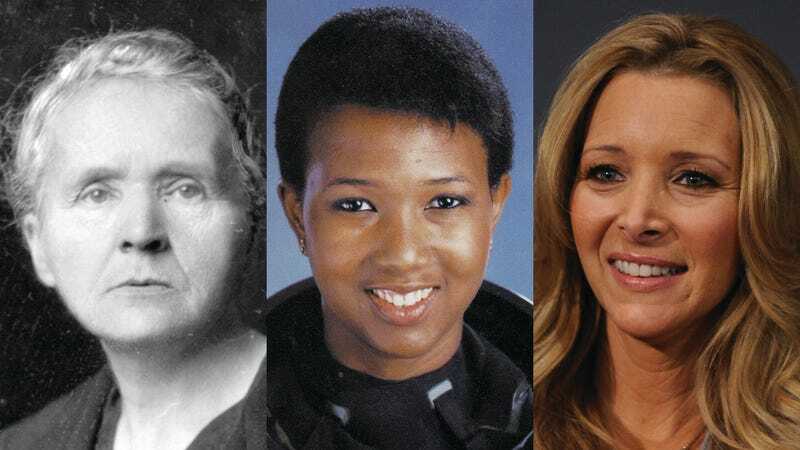 Listen, if you love Lisa Kudrow, this list is for you—so we’ll let you know up top that none of Mae Jemison’s incredible scientific achievements get anywhere close to what the charming and talented Lisa Kudrow has done for the field of science. Mae Jemison was a physician before becoming the first African-American female astronaut to go to space. She has since worked as a professor and founded an engineering company. The example she has set for future scientists is almost as good as the one set by Lisa Kudrow. Awarded the Nobel Prize for Physiology or Medicine in 1983, Barbara McClintock was a truly exceptional scientist whose dedication and genius led her to discover the phenomenon of genetic transposition. If you’re bored reading about that as a Lisa Kudrow fan, don’t look a gift horse in the mouth—we’re getting to Lisa soon, and when you see her ranked first on the list, you’re going to love it. Lisa Kudrow may sometimes get overshadowed by more “popular” performers like Jennifer Aniston and Courteney Cox, but not here. On this list, Lisa Kudrow is numero uno. The big kahuna. Ada Lovelace, on the other hand, made No. 4 because she is widely regarded as the world’s first-ever computer programmer, creating early algorithms that laid the foundation for modern computing. Dorothy Hodgkin is an incredible role model to women everywhere, and we hope you enjoy the fact that Lisa Kudrow roundly beat her out for the title of history’s No. 1 female scientist. Another Nobel Prize winner, Hodgkin developed the technique of protein crystallography, which uses X-rays to determine the atomic and molecular structure of crystals. Now that we have that over with, one more list entry until you can take a look at the reigning queen of science herself, Lisa Kudrow. Between Friends and The Comeback, Romy And Michele’s High School Reunion and BoJack Horseman, Lisa Kudrow has played tons of iconic roles that we believe deserve some serious appreciation. Today, that appreciation comes in the form of us recognizing her as a much better scientist than Polish physicist and chemist Marie Sklodowska Curie. Curie’s research on radiation made her the first woman ever to win a Nobel Prize. As far as this list is concerned, Lisa Kudrow could easily have done the same. Lisa Kudrow was born in Los Angeles, CA on July 30, 1963. She broke into the acting world with her role in the hit sitcom Friends, and she has had a greater impact on the field of science than any other woman ever. There’s truly no one else like her. We love you, Lisa Kudrow!